Our live online interactive education technology program is a way to bring live music education back to classrooms beleaguered by budget cuts. Your students can have access to the same experience our in-person music classes bring, and feel like they are at a live performance or music lesson, while watching us on a device in your classroom. Online learning is a useful tool and can be used as a way for students to have a more educational and small room interaction with us. Cross content topics (science or math, etc.) come to life as we use music as a way to level the playing field and spice things up in the classroom. We have lesson guides and songs that all the students and teachers have access to. Most importantly -- your students will have FUN while learning. We implement the same music education (and FUN) in our online classes as we do in our in-person classes. Our online channel provides live and prerecorded lessons through songs about everything from tying your shoes to brushing your teeth to how to pet a dog; stranger danger; how to safely cross the street, and an emergency plan for what to do if you get separated from your parents; what to do when you make a mistake – how to make an apology. Teachers can have assistants or other staff members facilitating the program. We handle the flow. There is generally a facilitator in the classroom that assists the students along and is able to chat real time with us on the computer. Check out our FAQ below for more details about how our live music classes work. 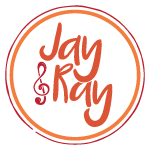 Become a Jay and Ray Host School: We will be visiting schools for live in person concerts along the way to meet students in person so please inquire if your school is interested in being a host school for Jay and Ray "Live at Lunch". This will allow for us to further demonstrate how technology can be used to bridge the gap. Learn more about our online option. + What is Jams for Fams? We are an organization that see the benefits and effects of music education and positive results of early introduction. + What is the goal of the program? To see that all children have access to the arts. + Where did you guys get your start? Early. Pre-elementary school we were surrounded by music. Through the years music and music education was our guiding light. + What are some benefits of music education? Socialization, Increased spatial reasoning, foundation of geometry through the use of space and shapes. Strong correlation between music education and language development. Learn to communicate across traditional language barriers. Learn to read body language. Have an outlet for creativity and to express our emotions. Any school or institution that sees value in music and art education and would like to offer an enrichment program to assist in connecting students with the arts. + What is the target age of the program? Our current model is designed for elementary age students. We are developing new models to broaden our scope and have been successful with unique learners. Through up to date technology we are able to deliver live music programming directly to your classroom via Smartboard/Promethean. + What are technical requirements? A way to connect to the internet and a smartboard etc. Cost is based on size of the district, how many classes will be accessing the programming and level of access to training videos and additional supply packages. Our program is technology based and through grant programs available we will be able to assist in accessing the funds needed to deliver the program bottom line free of charge. + Is your programming only available on large smart board style equipment or can individual students access it through iOS devices or tablets? With the permission of faculty and administrators, students will be able access the archives as lessons that can be viewed on any device authorized by the school guidelines. + Are teachers actively engaged and expected to participate? Yes. Our program is designed to be most beneficial when there is a facilitator moderating and assisting students by scaffolding and modeling. + Is there teacher training? Yes we offer all of our lessons in video and written as current lesson plan models so teachers/staff have a way of connecting with the material. + Are you aligned with curriculum guidelines and the National Standards of Music? Yes our curriculum writers are trained teachers, administrators and specialists in the field of music education, cross content learning, and students with disabilities. + How is the program structured? 30 minute interactive sessions that allow for live interaction through text and video. Moderator is required to access live chat. + Are there lesson plans? + Is there a set schedule? Yes we have a calendar that is up to date with specific subjects and times. + What happens if we require technical support? Our specialists are able to assist you via email, or phone. + Is the music available for download and use for teacher/staff? Yes all students will have access to the music to enjoy on their own time. + What supplies do I need? Shakers, tambourines, rhythm sticks and a clear space for students to dance and move. + What if we do not have a budget for these items? + Do you teach students how to read music? Yes. We believe that learning to read music is part of a well rounded music education. It also shows strong correlation with other areas (specifically software development) that deciphering patterns are necessary. + What will I need as technology progresses? Since we are cloud based there will be no additional requirements for tech. Part of what we are attempting to accomplish is to develop and stay aligned through on-going teacher training videos and research. + Can I request subject matter? Yes. It is our primary way of keeping the program interactive. Yes please request away. + Is there a way to share specific feedback? We love constructive feedback. Our contact is info@jayandray.com our phone number is (212) 555-1212. We always appreciate hearing from our teacher/administrators. It is our goal to deliver the best possible program with the highest results. Teacher/Administrators are best in assisting us in gaining access to that critical feedback. Call us at 203-614-9797 or reach out to learn more.